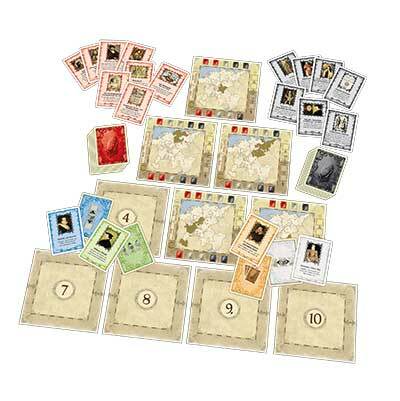 In Sola Fide: The Reformation, two players attempt to install Reformation in the Holy Roman Empire - or try to prevent it. Both are battling the Holy Roman Empire’s Imperial Circles. Despite earlier attempts, Martin Luther started the Reformation in 1517 with his "Ninety-Five Theses". Luther criticized the selling of indulgences and that the Catholic doctrine of the merits of the saints had no foundation in the gospel. The "Protestants" soon incorporated doctrinal changes such as Sola Scriptura and Sola Fide. The changes were not only theological, but also other factors played a role in The Reformation: the rise of nationalism, the Western Schism that eroded people's faith in the Papacy, the perceived corruption of the Roman Curia, the impact of humanism, and the new learning of the Renaissance that questioned much of traditional thought. The Roman Catholic Church responded with a Counter-Reformation initiated by the Council of Trent. 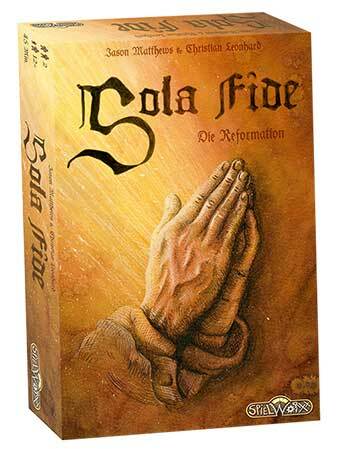 In Sola Fide: The Reformation the players play cards from their hands to gain influence in and eventually win the 10 Imperial Circles of the Holy Roman Empire. Sola Fide is mechanically simple, but game-play is intense and exiting! Sola Fide was never meant to be a detailed simulation of The Reformation – a very complex series of events. Instead, this game offers a lot of period flavor via its cards.